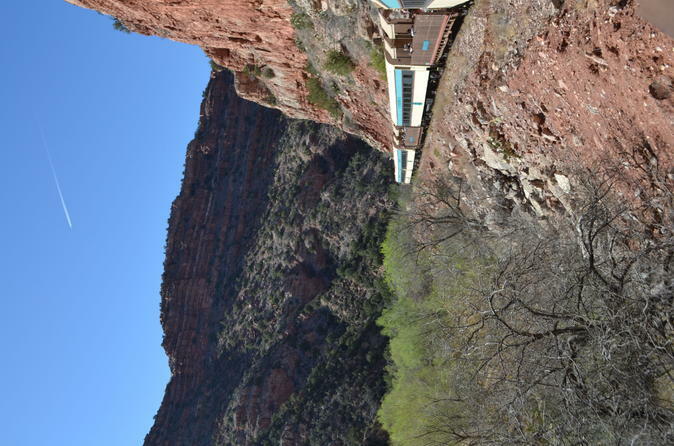 Enjoy a 4-hour sightseeing journey by train aboard the Verde Canyon Railroad, which glides through the beautiful wilderness of the American Southwest near Sedona. Nibble light refreshments while traveling on the Verde Canyon Railroad through Arizona’s desert. Ride in a vintage train car or open-air viewing car to get a great perspective on the region’s natural and cultural treasures. See ancient cliff dwellings built by the Native American Sinagua people, historic mining sites and more as your train cruises along a route that follows the Verde River. We were on this Railroad two years ago and it was much better then. We were disappointed in the narration; hardly any. Two years ago we heard all kinds of information about the valley we went through. This year hardly anything. We were in Cottonwood first class coach and couldn’t hear anything thru the speakers. So we got moved to another first class coach and we were in there by ourselves (4 of us) and there were only 2 speakers working. That was Wickenburg coach. The speakers were not loud enough. The scenery was beautiful but you need to have more narration about the valley and get those speakers louder! Thank you. We enjoyed the Ales on Rails event, but were so impressed by the entire experience we will return for every season! Plan to be in the open air car for the majority of the trip. You won't want to miss a thing! Not an "adventure" per se, but a fine way to wile away 4 hours looking at great scenery and learning about the local geology et al AND be served Champagne and a light buffet! Loved this train trip! Beautiful scenery and great service in 1st class car. Loved option of open cars. Would recommend trip to anyone visiting Arizona in the future!!! I loved this tour! It was a great way to see the red rocks up close without hiking or taking a bumpy jeep tour. The vintage train car has comfy couches and a bar. It includes appetizers/snacks and plenty of water. Each indoor car also has it's own outdoor car so you get panoramic views as you travel through the canyon. And there is a bathroom in each car as well. It was a very relaxing ride. We got a great day which made the ride all the more enjoyable. There is a recording that reviews the history of the canyon on the indoor car but then there was a live tour guide on the outdoor car who provided more detail and answered any questions. If you're looking for a relaxing afternoon with some great views I would definitely recommend this tour. As a reference, we stayed in Sedona. We got up early and drove to see Montezuma Castle and Well, Tuzigoot, lunch break, then the railroad tour. So by the time we go on board we were reading to relax. Relaxing ride along the river and the landscape is gorgeous. Staff is friendly and informative. Great experience - exceeded our expectations would definitely do it again in a different season. Beautiful scenery! Informed and helpful crew. Will definitely consider a second trip! 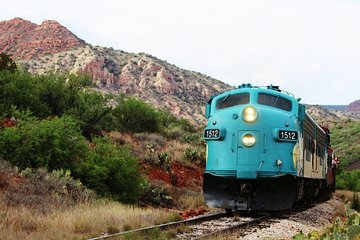 I booked a trip in Sedona - Verde Canyon Railway. It was for today at 13:00. When I arrived by taxi 48 I was told that there was no 1pm train and that I had been booked on the 17:30 train, without my knowledge let alone my consent. I told that the later time would mean that it would be impossible to take the photos I had planned to take. the reply was that there would be sufficient light to take photos on the outbound part of the trip. Well it was not possible and I am furious. I would never have booked an evening trip. I am travelling alone and my interest was the scenery, and hopefully the wildlife. If I had wanted to sit on a train in the dark I could have done that in the UK and not paid to do so in US. I should have been given the choice to have a refund, or change to a different day. The evening trip was mainly for parties which as I was by myself made me feel bad. I choose the trip for information not to have a celebration.